Leveraging Limited Resources – How TRI Volunteers Have Enabled TRI to Grow! In 2013, TRI made a serious commitment to its future. After 39 years, we hired our first employee. With limited money to pay for staff, the ability to grow was dependent upon our ability to leverage our scarce resources, specifically our greatest resource – our volunteers. Learn how TRI built and empowered its volunteer corps and in doing so, set itself on the path to becoming a sustainable non-profit organization. Christine is a graduate of Penn State University and holds her masters in International Development from Ohio University. 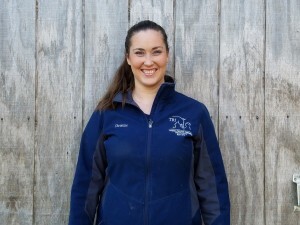 Upon joining the Therapeutic Riding Institute in 2013 as TRI’s 2nd employee, Christine was responsible for TRI’s volunteer program and grew their corps from 125 – 325 individuals through the implementation of strategic and efficient recruitment efforts and through the diversification of volunteer roles. At the same time, she has managed the development of TRI’s fundraising strategy, overseeing TRI’s revenue increase from $75,000 in 2012 to $400,000 in 2016. In her spare time, Christine sings with the Gem City Sweet Adeline’s Barbershop Chorus and the Lipstick Scoundrels Quartet. With an extensive background in theater and performance, her presentations are as engaging as they are informative.